(LA Times, by Saba Hamedy) – Students at the California Institute of the Arts (CalArts) are taking their work into new dimensions — literally. In an effort to pioneer new directions in immersive entertainment, the school’s advanced interactive media class gave students the opportunity to create audiovisual entertainment tailored to a 360-degree viewing environment. The Valencia institute, founded by Walt Disney and his brother Roy, is famous for its animation program. It boasts a robust roster of alumni including John Lasseter, chief creative officer at Pixar and Walt Disney Animation Studios, and Oscar-award winner Chris Buck (“Frozen”). The interactive media class partnered students with Vortex Immersion Media, a production, design and development company dedicated to delivering visionary immersive entertainment content. 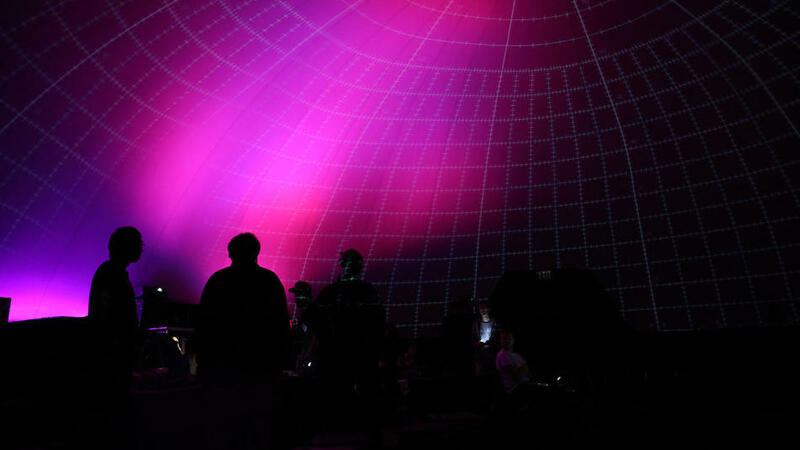 Using Vortex’s dome theater in downtown Los Angeles, students spent the last semester delving into interactive projects. The student projects “mix high and low tech techniques — ranging from game development systems that create real-time rendering in space, and live performance and music, to 2D and 3D projections, and low tech theatrical illusions,” according to the CalArts website. Ed Lantz, president at Vortex Immersion Media, emphasized the importance of mastering such new techniques in the evolving media landscape.